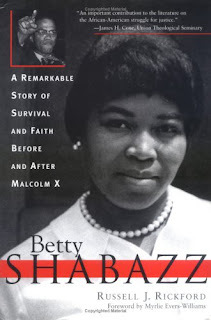 When Betty Shabazz moved to New York City in the mid-1950s to attend nursing school, she was introduced to the Nation of Islam one Friday night by a hospital worker who had invited her to dinner. After the meal, the woman invited Shabazz to a lecture. “I said, ‘Yeah, I’ll go.’ How could you not go? You just sat there and ate her good food,” says Shabazz, now public affairs director at Medgar Evers College in Brooklyn. The minister of the Harlem mosque wasn’t there that night, and Shabazz wasn’t particularly eager to join this mysterious religious organization. “I said my parents would kill me if I did something like that.” But Shabazz did find the Muslims courteous and hospitable. She attended a second meeting. It was then that she met the minister, Malcolm X. “He looked like he was hard-working and serious, yet he was young,” Shabazz says. Later, at a Muslim social function, Malcolm X talked with Shabazz about her experiences as a student at Tuskegee Institute. Raised in Michigan, she couldn’t comprehend the hostility that she and other black students encountered from Alabama whites. In 1958, Malcolm X and Betty Shabazz, then known as Betty X, were married. They had six children in seven years, all daughters. She was pregnant with twins, in fact, when Malcolm X was murdered in front of her eyes. This explains why Betty Shabazz, the widow of a martyr, didn’t feel she could throw herself into her husband’s political or spiritual roles. “I didn’t have any money. I had to support a family,” she says. She returned to school, earning her doctorate in higher education administration from the University of Massachusetts in 1975. What Shabazz is, by all appearances, is a confident, cordial career woman. And while being interviewed in Albany, N.Y., last weekend, where she was attending a convention, Shabazz had two other professional women – close friends from the Delta Sigma Theta sorority – in the hotel room with her.